Bianco Realty is always looking for motivated Real Estate professionals. 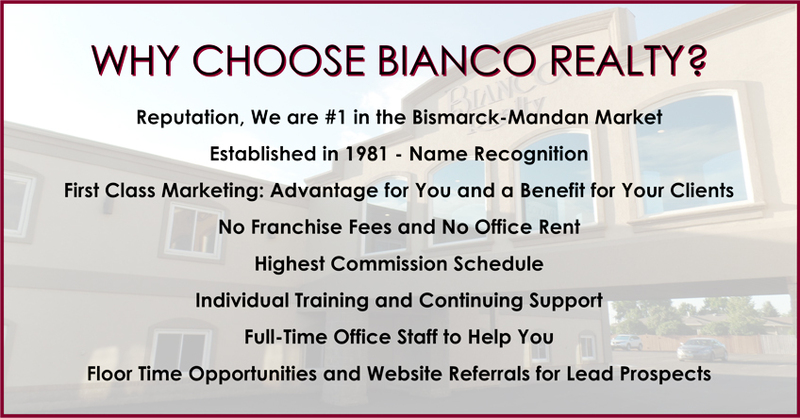 We encourage you to consider the profitable and supportive environment we offer at BIANCO REALTY. Bianco Realty welcomes the opportunity for a confidential interview with you. If you would like an appointment for an interview, or want to receive information on the educational and testing requirements you need to become a Real Estate professional, call Dale Vander Vorst (Sales Manager, Broker Associate), Justin Sackman (Business Development Manager, Broker Associate) or Kathy Feist (Broker/Owner) at 1.701.224.1100 or e-mail: manager@biancorealty.com. Bianco Realty’s success is due to the success of our REALTORS®. This is why we give our REALTORS® the best tools to be successful.